Fill out the form below to get notified. 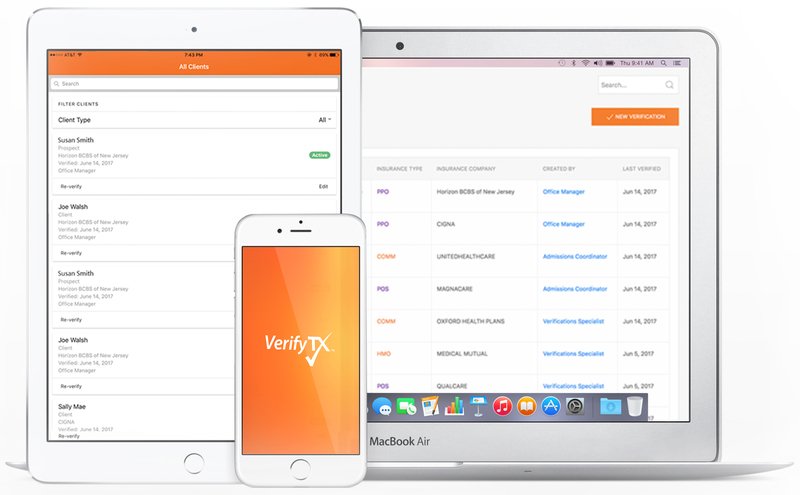 VerifyTX is a cloud-based (mobile/desktop) platform that accurately verifies insurance benefits in real-time. 24hrs a day – 7days a week including holidays in under 10 seconds from anywhere. We provide your staff with the information they need when they need it. a delay in verifying benefits? or an insurance policy lapse? or because of an error in a benefits verification? Our new VOB technology eliminates all of these costly errors by facilitating VOB’s faster and more accurately than ever before with the VerifyTx App. When someone is seeking treatment, they call several facilities looking for immediate assistance. Usually, the first facility to respond “yes” is the center to admit the patient. Tired of losing clients because you couldn’t respond fast enough? Verifying insurance benefits is a key qualifier in the admission process, but can take hours or days to complete. “Large centers close the client on the first call, and booked the fight ” Now you can too! End delays in the admissions process by providing your team with real-time access to key benefit information. How? VerifyTX has access to 500+ insurance company databased, and provides the most comprehensive VOB on the market. Improve your collection rate with no extra work. How do you ensure active coverage for each client on your census? You re-verify the policies during treatment. “We re-verify twice per month” is the industry norm. “I don’t think there is an efficient way to do it more than that”, we are told. Well there is now – problem solved! VerifyTX allows you to re-verify your entire census without any addition data entry or man power! It stores a record of the verification including Date Verified, Coverage Status, and Reference Number so when you’re denied in error, you stand a fighting chance getting paid! How often should you verify? Everyday. Why wouldn’t you? Don’t loss revenue you should be collecting. Fight the insurance company with the new way to verify. Other verification tools provide information only on the major insurance carriers — Aetna, BCBS, Cigna, and Humana — so when your team needs to verify a non-major insurance with a competing solution, they must wait in a queue or follow up on the next business day to check the benefits. VerifyTX removes the wait and closes the gap between insurance submission and client admission. VerifyTX captures termed policies by re-verifying weekly all current clients, ensuring continued benefits that prevent an inadvertent scholarship. Think of this as purchasing insurance that pays reimbursement checks every month. and protect your bottom line.